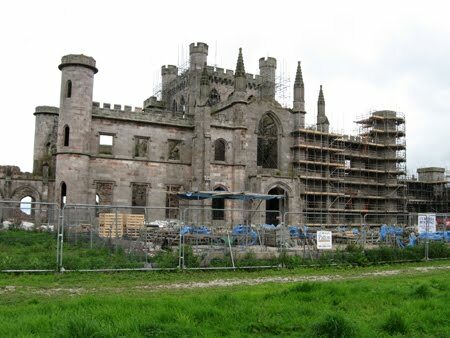 Lowther Castle and Gardens now in the early stages of a re-development programme is about 8 miles from Wetheral Cottages and being somewhat inquisitive as to what was happening there, it proved to be quite a rewarding hike around the gardens. The castle and gardens have lain neglected for about 70 years and whilst tracks have been forged through the 130 acres of grounds there is much still to be done, before it could be classified as a garden. However the walk around the grounds gave glimpses of past glories, with many features still remaining but somewhat overgrown. A summer house stands on the western edge of the grounds with marvellous views across the river Lowther to Helton and beyond. What a great testament to the craftsmen who built it and the quality of wood used. 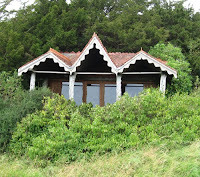 As if this structure has remained un-maintained for many years it is still in great shape today. 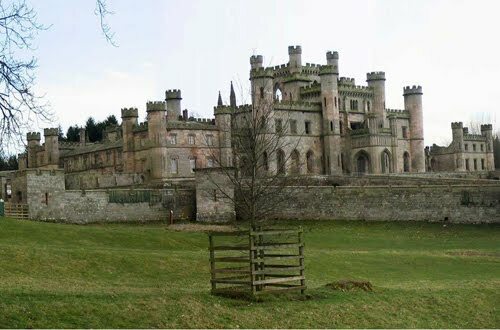 Lowther Castle was of course once the home of the Lonsdale family, who played a large roll in the development of Cumbria and especially West Cumbria having interests in mining and land ownership. Without going into a full family history of the Lonsdale family here, the Lowther Estates at their prime gained much wealth from coal mining and it was said you could travel from the West Cumbrian coast to the east coast without going off land owned by the Lowther Estates. The Estate is not that large today, but the most dashing of the previous Earls was Hugh, the Third Earl. Hugh was a great horseman and sportsman as well as a devotee of the turf, winning the St, Ledger. The Lonsdale Belt presented to Boxing recalls his interest in the sport. The Third Earl was also the first president of the Automobile Association and it was the bright yellow livery of the Lonsdale family which inspired their distinctive yellow, still used today. So with all their wealth it is not surprising that many famous names are recorded as working at Lowther Castle – “Capability Brown” was obviously connected with the gardens. The castle ruins that stand today were originally built about 1816 but abandoned about 70 years ago. During the Second World War the castle and some of the farm land nearby were used to test a secret tank weapon. In 1946 the contents of the castle were sold off. 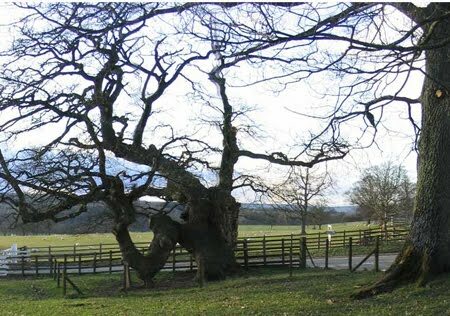 One piece of Lowther Folk Lore not in the gardens is an old oak tree on the edge of the park, and the reason this old oak tree is still standing and even has its branches supported is: that suppression has it that, should the tree or a branch fall to the ground, then so will the Earl of Lonsdale at that time. The Lowther Estates have hosted many Sheep Dog Trials in the past but this year they are hosting the World Sheep Dog Trials September 15th, to 18th,.